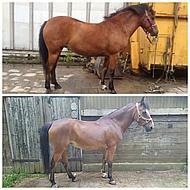 Complementary animal feed suitable for Horse / Pony. 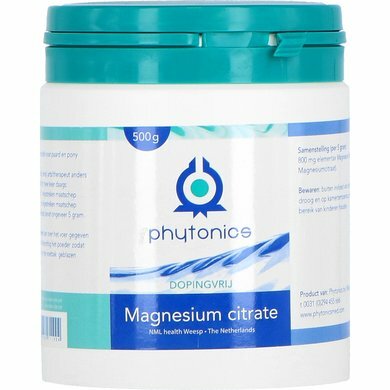 Magnesium deficiency has a negative effect on the gastrointestinal system, skeleton and the central nervous system. A magnesium deficiency generally results in a stress response. Possible symptoms may include: with stiff / stiff and tired muscles, lethargy, nausea, loss of appetite, vomiting, weakness, changes in behavior, to support the heart. 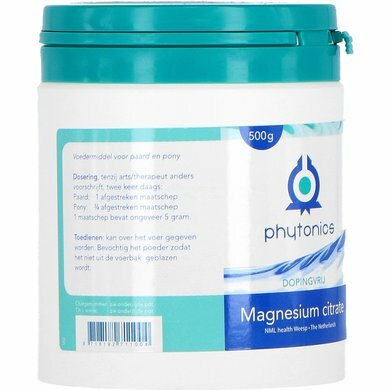 Magnesium activates many enzymes and plays an important role in many processes in the body: it has a relaxing effect on nerves and muscles. Magnesium is part of ATP, the energy carrier of the cell. Magnesium also plays a role in energy production. Magnesium plays a role in different places in the glucose metabolism. Magnesium is important for the building of bones and teeth. 1 measuring scoop contains about 5 grams. Can be given by the feed. Moisten the powder so that it is not blown out of the feeder. Always ensure good quality food. If there is no improvement during the treatment or if the symptoms keep repeating, you should consult your veterinarian. In an acute situation, the duration of treatment is relatively short. This can vary from a few days to 3 weeks. If you improve, continue to administer this product for several days. With long-term discomfort, the effect is usually visible after 1 to 3 weeks. In case of improvement, a maintenance dose can be changed. This is usually half the indicated dosage on the package. When dosing this product, look carefully at the reaction of the animal. In the beginning a higher dose may be required, this product can be given safely in a double dose. Gradually lower the dose to as low a dose as possible. This product can be given permanently. It is advisable to insert a stop week after every 6 to 8 weeks. Thus, the stimulus can be offered again after the stop week. Resume treatment immediately if there is reason to do so. This product can be used without any problem in combination with other natural health products and regular medicines. For the muscles in combination with Pure Nature Muscle Building. 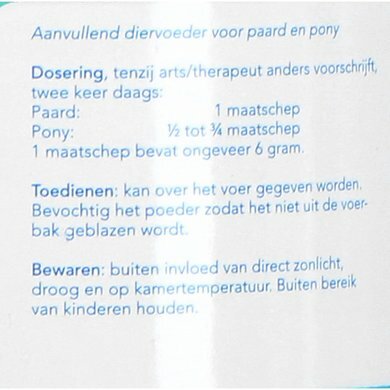 For the hooves in combination with Pure Nature Podo. This product contains 500 grams in a pot. Read the package leaflet / instructions on the packaging before use. Give it to the horses for a while, really notice. Good to do at intervals. Pass it through the muesli and be well absorbed. I started using the magnesium when my crossing Tinker x Appaloosa became laminitis. A huge improvement within a few days. Since then, as a maintenance base, all year round! 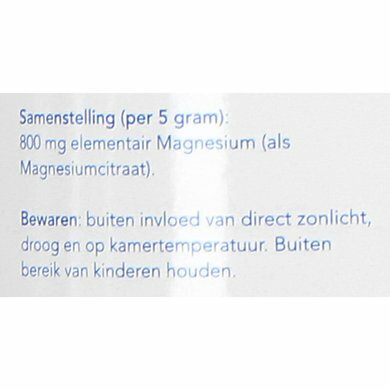 this magnesium was purchased on the recommendation of osteopath. and it really works. our pony is much more relaxed. easy to carry over the lump. 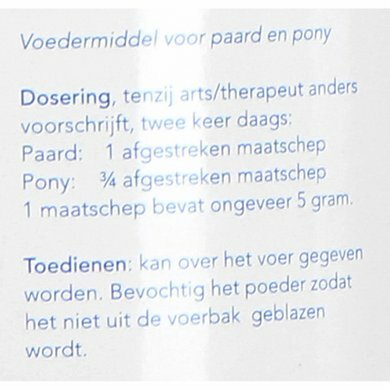 My Shetland is given the magnesium as support (due to laminitis and stiff muscles). She reacts very well here. Works as described. Takes away visible tension. Question: Good day, my horse may be insulin resistant. So I want to largely exclude sugar. Has sugar been added to this product? Thank you. Kind regards. 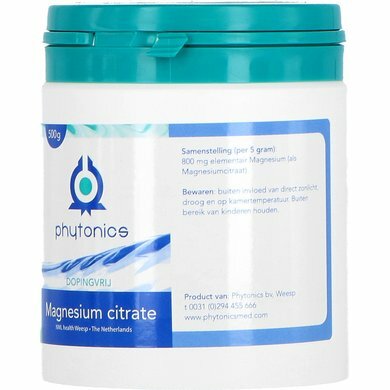 Answer: No sugar was added to Phytonics Magnesium Citrate PP 500gr.